September 16, 2015, 1:58 PM · When both your parents and grandparents are accomplished musicians, music plays an inevitable part of your childhood. Certainly that was the case for violinist Michael Barenboim, 29, whose parents are the famous conductor/pianist Daniel Barenboim and pianist Elena Bashkirova. But this did not ensure that he would be a musician. "Your parents can make you practice, but they can't make you want to be an artist," said Michael, speaking with me over the telephone in August. Michael, who will perform the Beethoven Violin Concerto with the Los Angeles Chamber Orchestra this weekend, has performed as a soloist and chamber musician all over the world and has been the longtime concertmaster of the West-Eastern Divan Orchestra, founded by his father to promote Israeli-Palestinian harmony. He spoke with me about that decision to go in to music, about his involvement with the West-Eastern Divan, about working with Pierre Boulez, about writing cadenzas and more. Michael Barenboim. Photo by Janine Escher. Born in Paris, Michael Barenboim's family moved to Berlin when he was seven, and that is when he started playing the violin. He liked it from the beginning, "and I think that helps, if you already have some kind of affinity with the instrument and with whatever is involved," said Michael. "But from then on, it's a lot of practicing and a lot of work. That's not always something children enjoy." His parents supported his musical endeavors but did not pressure him. In fact, he explored other interests, enrolling at the Sorbonne in Paris as a philosophy student. But after a few years, music called him back. "To be an artist, the main requisite is that you have this absolute necessity of being an artist, you have a feeling that you have no choice," he said. While studying philosophy, "I got this feeling very quickly. I then studied violin and started taking it really seriously. From then on it's been a lot of hard work." One of the formative influences in his life has been his involvement with the West-Eastern Divan Orchestra, created in 1999 by his father and Edward Saïd, the Palestinian scholar who taught at Columbia University, to bring together Israeli, Palestinian and Arab musicians. Daniel Barenboim has called it "a project against ignorance." "I joined the orchestra when I was 14, in 2000, and my core musical education was in that orchestra, in that project," Michael said. The group meets annually for a summer workshop and tour, with occasional projects during the year. "The West-Eastern Divan is there to offer an alternative way of thinking about the region, based on dialogue and also understanding the other's position and the other's narratives. It's all based on this idea that we are able to talk to each other because first of all, we're all musicians and we're interested in the same thing; and second of all, because we are all willing to listen to each other. When you make music, you are forced to listen to the other." 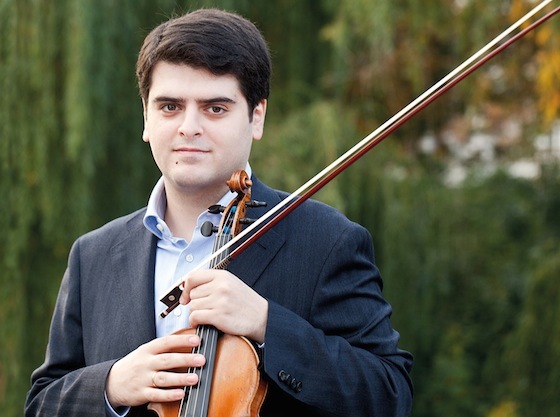 In the case of the West-Eastern Divan, his father conducts the orchestra, but Michael Barenboim, who has performed both as the group's concertmaster and as a soloist, does not really think about that. "When there's a rehearsal, there's a rehearsal," he said. "It doesn't matter if they're your parents or your friends or your enemies. It's important to concentrate and focus on what you have to do. If you think too much about these things, the only thing that suffers is the result. For me, it has been a great privilege to have been a part of this and to have had this education through this orchestra." And an orchestral background is something very helpful to a soloist. "When you play in orchestra, it's always a collective effort," Michael said. "Even if there is a flute solo -- the flute solo means nothing, without whatever is going on next to him. So the first thing that I learned was: how do I integrate my way of playing into the group -- into the first violin group, or into the whole orchestra? What is my musical role in this specific passage? Am I playing a main voice? Am I playing counterpoint? Am I playing accompaniment? The bare essence of it is that you have to know what you're doing, what musical role you're playing at a certain moment, and to be able to play it well. That means knowing the pieces very well, so you can contribute to the collective effort. Otherwise you're just playing on your own." Beyond that, orchestra playing gives one a certain depth of perspective, when it comes to the repertoire. "If I'm playing the Beethoven Violin Concerto, it helps that I have played all the nine symphonies, that I played a couple of string quartets, that I played other chamber music by Beethoven," he said. "I've listened to Beethoven piano sonatas. I know the idiom, Beethoven. I know the way that certain gestures mean something. You wouldn't want to limit yourself only to the things that you play; it's not enough to know just the violin concerto. It is also important to know, for this composer, what are the ideas that are being transmitted in this music? You can only know that if you know if you know the chamber music, the orchestral music, etc." Speaking of Beethoven, Michael performs the Beethoven with his own cadenzas. "I wrote those cadenzas when I played it for the first time. I was maybe 22," he said. "I wrote cadenzas not only for the Beethoven but also for Brahms and for the Mozart concertos I played, and every time I relearn the pieces I always change something in the cadenza. In this case, I changed the end of the first-movement cadenza and I changed half of the third-movement cadenza because I wasn't happy with it. It's basically a constant work-in-progress, where every time I pick up a concerto, I'm unhappy with what I did and I write it again!" "Where there's no cadenza written by the composer, I would always recommend writing one," Michael said. "Even if you don't intend play it, it makes you learn the piece better. If you write the cadenza, you actually have to deal with the musical material that's in front of you. You have to think about, what does this mean? How is this connected to this? You have to think of form. Even if you then throw away the cadenza you wrote, that work alone is going to help you in playing the concerto. You can still take Kreisler or Joachim or whatever is the standard cadenza. It makes you go through a thought process that you wouldn't otherwise do. It's always a good idea, even if you're young and you have no idea what you're doing. For Michael Barenboim, a piece like the Beethoven concerto is also informed by his work with contemporary music, and contemporary composers. "When you learn Mozart, you learn things that apply to contemporary music, but it also works the other way around: if you play contemporary music, you also learn a lot about older music," Michael said. "The experience is much more enriching when you have a broader understanding of what music history encompasses. I believe that it's very important not to limit oneself to just, let's say, the 19th century core classical-Romantic repertoire." Michael has a good deal of contemporary music in his repertoire, and he has worked personally with the French composer and conductor, Pierre Boulez, who celebrated his 90th birthday last spring. "Of course, when I got the chance to work with Boulez, I was really happy, to put it mildly," he said. "I played the Schoenberg Violin Concerto for him, and he was very patient with me. I learned how to approach this piece, in particular, but also any kind of music in general, through working with him. So I owe him much more than is apparent at first because I learned a lot of what of I think I know through working with him. "In this specific concerto, there are many technical difficulties, many involving chords, and harmonics. (Schoenberg) makes the violinist play these chords in very high positions and at very high speeds, and also the harmonics -- double-stop harmonics -- at very high speeds," Michael said. "How do you play a chord in 10th or 11th position? It's a bit tricky, you have to play around with the fingerings. But with the harmonics, that's where (Boulez) helped me out the most. When you're practicing such a difficult piece you almost forget the things that you have to do that are actually basic. When you play harmonics, you have to play with the bow close to the bridge so the harmonics speak quicker and more clearly. But at the moment when you're practicing this piece that's so hard, you tend to forget things, then someone like him, who is very practical, will tell you, 'I think when you play harmonics you have to play closer to the bridge,' and then you think, 'Oh my God what an idiot I am, I should have known this before!' For someone like him to tell me that! It's also things like this." Boulez, who is not a violinist, nonetheless displays a complex knowledge of the instrument. "If you look at the solo violin piece that he wrote, Anthèmes, you can see that he knows the instrument inside out," Michael said. So what kind of violin does Michael Barenboim play? "I never say what kind of violin I play!" he said. Whether his performances go well or not, he does not want to give that responsibility to the instrument. "The person playing the instrument is the one responsible for what comes out of it," he said. "A great violin will help, to find more sound color, more texture, more of this or that, but the sole responsibility lies with the player, in the end." September 20, 2015 at 09:16 PM · Violinists are a rare breed of Good People !! !